I can help myself. When Christmas and Advent come around I feel compelled to read Barth's Christmas sermons in Deliverance to the Captives. The sermons themselves are small so there is rarely anything "new" for me to discover. Instead, little sentences and phrases strike a harmonized chord more than they did at their last reading. 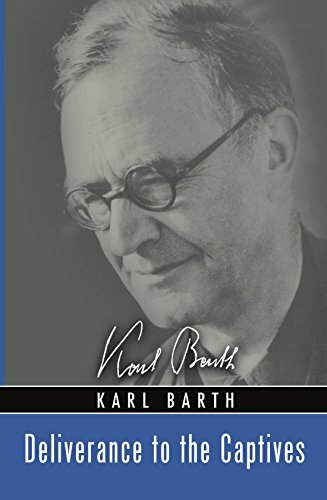 This time around reading the sermon "The Great Dispensation," I was reminded of the importance of Prayer to the doctrines of sanctification and ethics to Barth. I have written previously via this sermon's text on anxiety, but it was the later portion of this sermon that stood out this time. "The coming of this Lord is the mystery of the great dispensation. As the storms of spring thaw the ice and snow, and the fire kindles the tinder, the Lord wipes out our anxieties and sweep them away. We need not care because we are taking care of, because we are rightfully released from the grip of anxiety, because it would be wrong to worry all the same? In the face of God drawing near to us in Jesus Christ, the New Testament ceases for anxiety to be a Christian experience. And yet, believers find in themselves an attraction and desire for the importance of anxiety. We find ourselves seeking something that lets us think about ourselves independent of God. Only prayer, then? Yes, only prayer! Have you ever really tried to cast all your cares for the Lord in incessant prayer…Whoever has tried and done this knows the such prayer, nothing but prayer, includes villages, steady and effective action. He is not afraid that prayer might not be sufficient. Rather, through prayer, he will be incited to bring his life, his thoughts, his words, and his deeds step-by-step into accordance with his supplications. He will make small and unassuming, yet very unintentional and unforeseeable way, he will shed some light for others on this dark Earth.